Located in the Ala Moana Shopping Center, the Crack Seed Center has been the destination for locals and visitors for over 40 years. 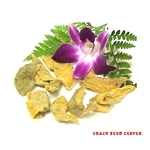 Crack seed is often referred to as crackseed, crackseeds or crack seeds. The basic ingredients are salt, sugar licorice extract applied to whatever fruit is being preserved. The most popular items to preserve include plums, cherries, mangos, gingers, lemons, and apricots. Li Hing Mui Powder, Wasabi, Arare, & Crackseed! Scrumptious slices of sweet guava. If you enjoy guava, check out our Li Hing Guava. The exact color, size, and taste of our products may vary due to nature and/or the personal taste of the manufacturer. Prices may change without notice and stock may run out at anytime. See our items on sale right now! Looking for the perfect Gift?? Try sending one of our Custom GIFT BASKETS. Join us now on Twitter (@CrackSeedCenter) and on Facebook to receive our special online offers! EVERY DAY SHIPPING SPECIAL: Buy More and Save on Shipping!! Maximum Shipping Cost (including handling) is $18.30, no matter how much you buy!!! Offer excludes international and express shipping. Please note orders are only processed and shipped during the business week. :: What is Crack Seed? Keep updated on our new arrivals and monthly specials. Home | About Us | Contact Information Copyright © 2004 Crack Seed Center. All Rights Reserved.